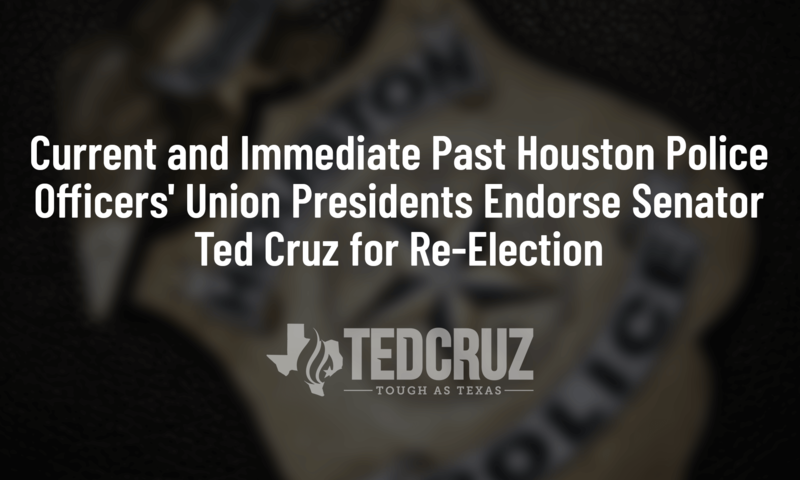 HOUSTON, Texas – Houston Police Officers’ Union (HPOU) President and Immediate Past President both endorsed Senator Ted Cruz for re-election today. HPOU is one of the largest police unions in the United States, providing support to Houston police officers since 1945. Senator Ted Cruz is a strong supporter of law enforcement, notably introducing the “Back the Blue Act” which increases federal penalties on assaulting or killing a law enforcement officer. Conversely, Congressman Beto O’Rourke has becoming hostile towards law enforcement officials, recently referring to police officers as “the new Jim Crow.” As a Congressman, O’Rourke voted to prevent funding for crucial law enforcement supplies and voted to significantly reduce Immigration and Customs Enforcement budget. The choice for law enforcement is clear in Senator Ted Cruz.